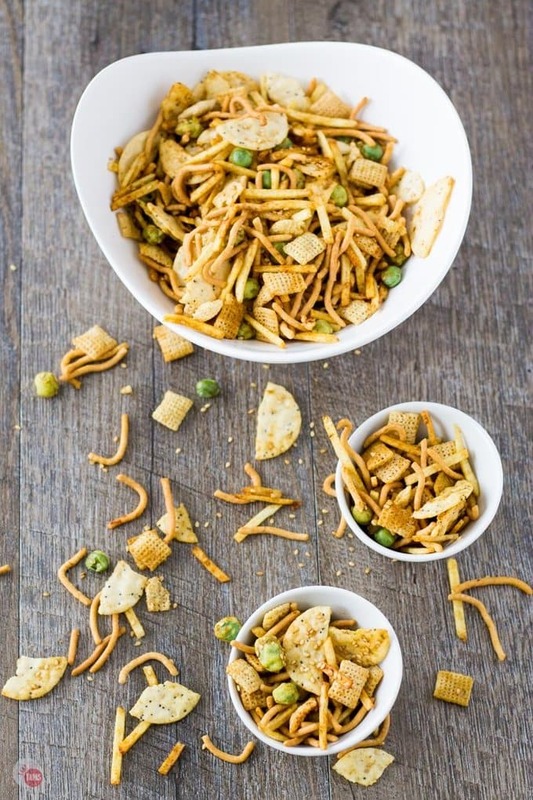 Asian Wasabi Chex Mix Party Snack for Far East Snacking! 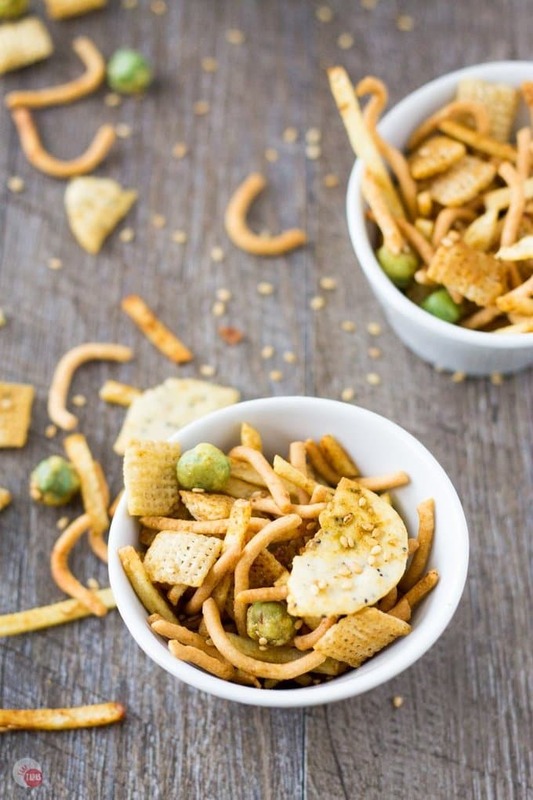 Home » Asian Wasabi Chex Mix For Far East Snacking! Snack mix takes a trip around the globe and lands in Asia! 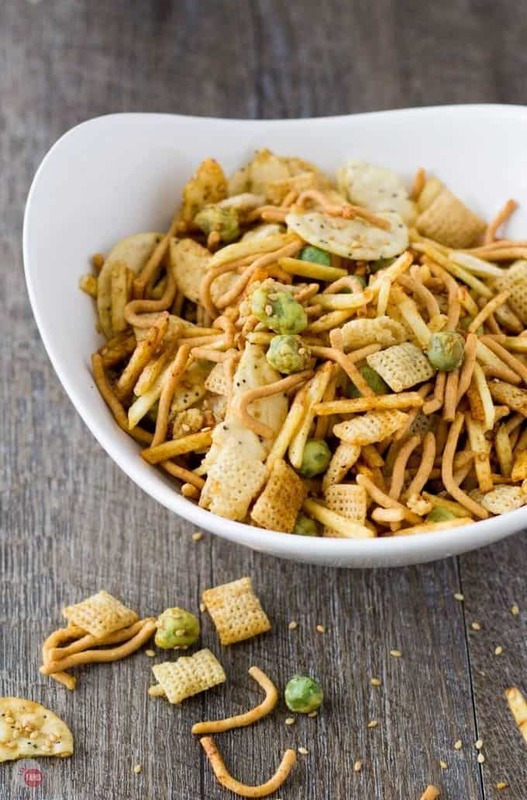 My Asian Wasabi Chex Mix is loaded with rice Chex cereal squares, sesame seeds, rice crackers, crunchy chow mein noodles, crispy wasabi peas, and coated with a soy wasabi sauce! So just because my last snack mix got a little hot and bothered, doesn’t mean that the next one has to settle down a bit. I am taking the spicy train for one more quick ride all the way to wasabi city. Is Wasabi city in the states? Nope, it’s in the Far East and that is where I am taking my wasabi Chex mix. If you want to come along, there are plenty of seats open! Speaking of not settling down, I am in full on recipe idea mode. Once I decide to put together an appetizer like a snack mix or nachos, I try and figure out who many variations I can do on that one staple dish. This works well for my brain because I can just doodle out any and everything I would eat on a nacho chip, chicken wing, or pizza. This is especially true for snack mixes. The original Chex mix is a combination of crackers and nuts, and a sauce with butter and Worcestershire sauce and some spices. Having a great base recipe is the start of a million variations. If you don’t like pretzels, grab something else crunchy like a potato chip. If you are not a fan of peanuts use pecans or walnuts instead. The combinations are endless. I also use Chex in my Sriracha Snack Mix and my Crack Chex Party Mix if you are looking for more inspiration. But, right now, back to this one! Looking for ingredient variations turns into a kind of scavenger hunt for me. It’s pretty comical when I go on ingredient hunts in the store, and I get a ton of strange looks. How many different kinds of anything can I fit in my cart? A bunch! I use the smaller carts to help curb this but it is always in vain. Walking down the cracker aisle, I start throwing in every type of cracker and chip I can find. Then grouping foods in the cart, mixing and matching, and shuffling them around to see what combinations jump out at me. Then I buy them all and take them home. No wonder the door on my snack cabinet at home broke off. Knowing that I wanted to make my Chex mix Asian, I went to the Asian/Ethnic section and started looking around. Our section is pretty small, being that we are such a small town, I didn’t have much of a selection. Potato sticks case in point. Rice Chex cereal is a given, sesame thin crackers are a natural way to go, chow mein noodles jump out at me, and the last can of wasabi peas are begging me to take them home. Toss them all together and I have a great start to the wasabi Chex mix. On to the sauce! The base recipe for the sauce is butter, Worcestershire, garlic powder, onion powder, and a seasoned salt. This is a great start and easy to add some Far East flavors to it. I will keep the butter because, well, it’s butter! Switching Worcestershire for soy sauce and ground ginger for garlic powder is super easy. The soy sauce is salty enough so I add just a tad of plain salt. A dash of sesame oil replaced a little of the butter and a generous amount of wasabi sauce to up the spice factor. Wasabi peas are forever on my mind so more wasabi sauce is the way to go! Right?!?! Who’s with me? 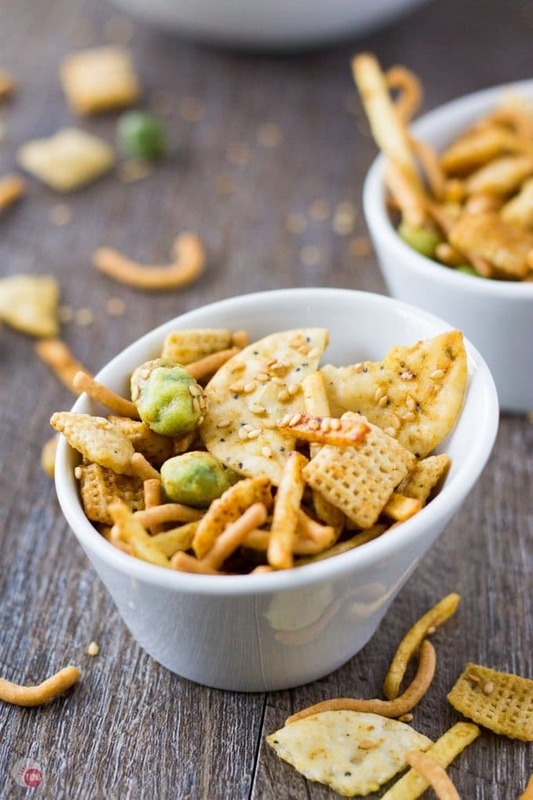 This Asian Wasabi Chex Mix will impress your guests and show them how worldly a host you are! 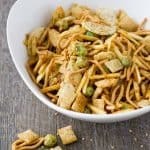 My Asian Wasabi Chex Mix is loaded with sesame seeds, rice crackers, crunchy chow mein noodles, crispy wasabi peas, and coated with a soy wasabi sauce! Mix all the Chex mix crackers and other snack ingredients. In a separate bowl mix all the ingredients for the sauce in a bowl. Pour over over the Chex mix and stir to coat evenly. Pour Chex mix on a baking sheet and spread out evenly. Store in an air-tight container until it’s all eaten! After making some traditional che x mix, I was wondering if there was a recipe Wasabi Chex mix and here it is!!! Can’t wait to try this. So glad you found it! I hope you like it! It’s one of my favorites after my redneck one! This sounds like such an addicting snack mix! I love the idea of using wasabi! Yes to the wasabi peas, my favorite! This is a great snack to pack up while traveling or hiking! Wasabi is so clever… can I tell you haw surprised my company was with this? They LOVEd it! The only problem is I didnt make enough…. definitely need to triple the recipe for next time! This chex mix is BRILLIANT!! I adore wasabi, and to add it to a snack mix?? I am doomed — I won’t be able to leave this alone!! This jacked-up chex mix looks like a powerfully addictive snack. Talk about a dynamic duo; wasabi and chex mix? Here. I. Come! Thanks for another delicious idea! I could snack on this all day! Love the crunch and flavors in this party mix! Printing and making to snack on for Fathers Day! Thanks! What a fun way to have Chex Mix. This might be an interesting take on a Chinese New Year theme. Thanks! I forgot all about the new year celebrations! I love wasabi!! Thanks for sharing on the What’s for Dinner link up!